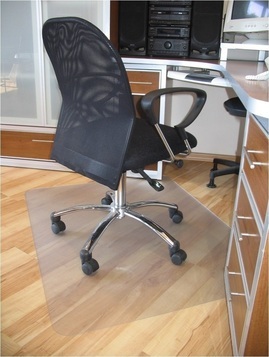 Compare Office Chair Mats: Bamboo, Wood Laminate or Plastic (PVC/Polycarbonate)? 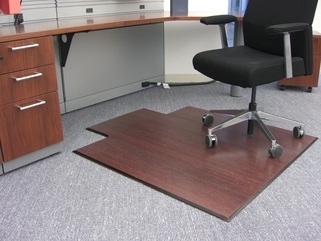 To facilitate rolling the chair along the desk to conveniently access stuff like printer/scanner, phone, file drawers, etc. To avoid any damage that can be caused over time by the chair to the floor surface or to the carpet if there is one. Indeed, if your office space has carpets, you would find it quite difficult and frustrating rolling the chair easily and quickly from one place to the next because of the resistance caused by the carpet. On the other hand, if your office does not have any carpet and is some sort of hard floor such as wood or linoleum, a chair mat will help protect it from abrasion, scratches, chips and other types of wear and tear. The most common types of chair mats are either made of plastic (PVC), wood laminate or bamboo. Clearly, bamboo mats are the most expensive, so you may be wondering if the benefits of bamboo over plastic and wood laminate mats are worth the extra cost. This article will compare the three types of mats so you can make an informed decision before you get yours. Durability: While wood laminate is more resistant than bamboo to abrasion, bamboo is a lot more resistant than wood to humidity and moisture. However, given that home office environments are not high traffic places and because humidity is well controlled in most homes, these factors should not be critical in your decision to choose between bamboo or wood laminate. But overall, bamboo mats will last longer, because once the top layer of a wood laminate mat is destroyed, there will be no protection for the decorative layer and support material that's underneath, and pretty soon the mat will be unusable. On the other hand, when a bamboo mat is scratched or damaged on the surface, because there is still high quality bamboo underneath, it can still be used for a very long time. Appearance: Even though bamboo looks much richer and more elegant than wood laminate, nowadays some wood laminate mats have quite attractive looking finishes. Note that both types of mats can be obtained in a number of colors. But while bamboo is a very attractive wood with an awesome natural built-in finish, it is difficult to stain because of the shiny and non-porous silica coating on its surface that prevents any stain or paint from being absorbed in. Staining bamboo is complex and requires first sanding the surface to remove non-porous silica coating. On the other hand, wood laminate mats can be easily stained like any type of wood into any color you want. So, if you think you may want to change the color of your mat sometime in the future, it makes more sense to get a wood laminate mat. Noise Absorption: Bamboo absorbs noise better than wood laminate when you step on the mat or roll the chair on it, unless some sort of noise absorbing under-layer is attached to the wood laminate mat. Price: Wood Laminate mats cost in general less than bamboo mats, but because some wood laminate mats today have very attractive finishes, they might come at a cost comparable to bamboo mats. Chair mats are also available in plastic, but plastic comes in a number of types and grades. In the past, plastic mats have not had as good a reputation as wood or bamboo mats. That is mainly because plastic is not as hard and resistant to impact as wood or bamboo, and under certain circumstances it may leak certain dangerous chemicals into the environment. Hardness of the plastic is very important because hard plastic will enable better rollin of the chair on the mat and prevent the chair from sinking into the mat and getting stuck. But nowadays, newer and better grades of plastic compounds are used to manufacture excellent plastic mats with much better durability, impact resistance and no health hazards. PVC has only moderate durability and hardness. Therefore PVC chair mats are likely to break much sooner than wood laminate or bamboo mats and would need to be replaced. But the main concern with PVC mats is that during their production certain carcinogen plasticizing additives known as phthalates must be used. Under certain circumstances, these plasticizers can escape from the final product ending up in the surrounding environment and representing a health hazard. Polycarbonate plastic is much harder than PVC and therefore can be used to manufacture chair mats that are break and impact resistant. Indeed, it is so strong that it is even used in military and civil aviation. It is known for durability and lack of deterioration over time. it is also fire resistant, transparent (PVC mats are translucent), odorless, and most of all free of any health threatening chemical compounds (such as phthalates). However, there is one downside that comes with the hardness of polycarbonate: because such mats are harder and not designed to flex, if enough pressure is applied, they could eventually crack. Therefore, it is recommended that polycarbonate mats be used on hard surfaces and lower pile carpets. Because PVC chair mats cost less, they will still be considered by some as an option, but given the numerous benefits of polycarbonate plastic, we strongly recommend polycarbonate chair mats over PVC when used on hard surfaces and lower pile carpets. When choosing between bamboo/wood and PVC plastic chair mats, we definitely recommend bamboo/wood over PVC plastic for the reasons given above. When you choose between bamboo/wood and polycarbonate, because with regards to impact resistance and durability polycarbonate is just as good (and sometimes even better) than bamboo/wood, because health-wise they are just as harmless, and finally because they cost about the same, your choice should really depend on taste and aesthetics. Polycarbonate plastic is transparent, so if you'd like the floor to show under the mat, you should choose a polycarbonate map. On the other hand, if you want a mat that comes in color, then you should go for wood laminate or bamboo. Please click the bamboo chair mat of your choice below for price information or to purchase. Please click the wood laminte chair mat of your choice below for price information or to purchase. Please click the plastic chair mat of your choice below for price information or to purchase.